Any systematic interpretation of correlated facts of existence � be it a primitive, magical interpretation of natural events, a "great religion," a philosophical or cosmological system, or the application of the "scientific method" � is undertaken to fulfill a collective human need. I use the term need in its broadest sense here, and it includes what is usually considered play: children and animals play to satisfy biological needs. For adult human beings, play satisfies not only physical but, more especially, psychological and sociocultural needs; collective games and sports strengthen the community spirit. The Hindu interpretation of the totality of world events as the Play (lila) of Brahma in turn can be interpreted as a theistic symbolization of the cyclic fulfillment of an ever-repeated cosmogenic need. 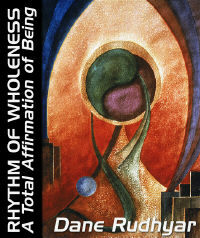 As we shall see throughout this book, the actual appearance and existence of the objective universe also meets a fundamental need which takes a multitude of forms and which can be metaphysically interpreted: the need of Wholeness. The primary need of any form of existence is survival as a whole, that is, as an integral system of activities. The basic imperative for all biological species is to survive in the harsh, competitive conditions of the biosphere. At the human level, this need can be met only through cooperation � in acts and thinking � thus through social organization and culture. As mankind has evolved from a primitive, unselfconscious, and compulsive state of quasi-animal, instinctual group activity and awareness, and has reached its present condition of highly technological and intellectualized existence in complex social and multi-national systems of organization, a great variety of psychic, emotional, personal, and intellectual needs have taken ever-changing forms. Especially today new ones are emerging, engendered by the extremely rapid transformation of the way of life of most human groups and individuals. This transformation has been occurring under the pressure of the industrial and electronic revolutions, which in turn both resulted from and intensified the development of a historically new kind of consciousness � the personalized and mentalized consciousness of "individuals" intent on asserting a centralized and autonomous type of activity. A descriptive, personalistic psychology such as Abraham Maslow's speaks of a hierarchy of human needs. This is practical and valuable when dealing with the results of the frustration of these needs. But all psychological systems are based on a philosophical and ontological approach to the total set of human experiences called reality. We may speak here of metaphysics, but this term is unfortunate and today rather meaningless, for it has been used in several ways. The basic question is not how to interpret what is beyond (meta) the physical world, but to define the approach one takes to the fact of being � thus to what is. What is called knowledge is, at any stage of human evolution and cultural development, a set of images and concepts (or symbols and principles of organization) according to which the collectivity of human beings interprets what all its "sane" and mature members accept as "facts." This includes facts of perception and of individual and collective responses to perceptions which come either through the senses or through internal changes of feeling (including what is imprecisely called intuition). Human knowledge constantly changes. New facts arise which require new interpretations. These, in turn, must be formulated in new symbols, images, artistic forms, and words. Even principles of interpretation gradually evolve, because the fundamental values of the interpreting consciousness and the frame of reference giving the interpretation consistency and meaning periodically alter. Each culture, or rather culture-whole, develops its own set of symbols and bases for interpretation. Culture-wholes are collective psychosocial organisms � that is, they are organized systems of collective psychic and social activities. At the core of a culture-whole's psychism is its dominant religion and the set of symbols, images, myths, rites, values, attitudes, and beliefs which constitute its collectively accepted interpretations of reality and approach to existence. As these evolve and change, the culture-whole matures. Eventually, when the integrity and consistency of its psychic core breaks down under the introduction of facts or factors it cannot assimilate, it disintegrates. Although each culture-whole develops according to its own rhythms, a common pattern underlies the development of all cultures. Three periods of development may be distinguished, even though they usually cannot be precisely separated from one another. Each new development surpasses yet incorporates the preceding ones. The new has to be sustained by the root-energy operating at the primordial level of biology and most often by collective psychism. This is necessary at least until a completely new mode of being takes control, powered by a radically different type of energy.